Taizé in Eastern France is a world famous centre of ecumenical prayer and pilgrimage, attracting hundreds of thousands of visitors each year, especially young people. It was founded by Brother Roger Schutz. He was born and raised in Switzerland where he became the leader of the Swiss Student Christian Movement. Brother Roger arrived in Taizé amidst the Nazi invasion of France in 1940, convinced that his calling was to help the poor. For the next 65 years up to his tragic death in 2005, he worked to bring all people closer to Christ through prayer and reflection. That desire is still key to the work of the Taizé Community today. 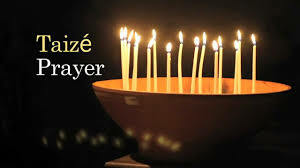 In All Saints we have begun holding Taizé services on a regular basis. 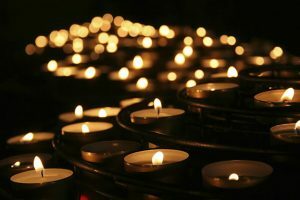 We try to emulate the form of ecumenical worship practised in Taizé, with the emphasis being on the gentle singing of chants devised in Taizé, contemplation, silence and prayer. The light of many candles is an integral part of the service. There are no sermons, there is no liturgy, there are short readings and prayers. At present we use professionally produced backing tracks to accompany the chants that we sing. A single chant may last for 3-5 minutes. Usually about seven chants are the basis for the service. Singing or not singing is entirely up to the individual. Those who have experienced these services with us say that, after the words of a single chant have been repeated continuously, the sense of peace, which begins to enter the service, is profound.